High-resolution spectra of 30 late-type and 9 early-type candidatemembers of the young (50-80 Myr) open clusters NGC 2451 A and Bhave been analyzed in order to complement our previous photometric andX-ray study. Cluster membership of these X-ray selected stars has beenconfirmed or rejected on the basis of radial velocity and Hαchromospheric emission. The metallicity of both clusters seems to beabout solar - contrary to previous investigations. Lithium abundanceshave been determined by two different methods, namely curve-of-growthtechniques and spectrum synthesis, yielding quite consistent results.The pattern of Li abundances versus effective temperature resembles thatof the equally-old Alpha Per cluster, i.e., little Li depletion is seenfor solar-type and earlier-type stars, while towards cooler stars Li ismore and more depleted, possibly showing a star-to-star scatter below 5200 K. The hottest star in our sample shows a Li abundance0.5 dex higher than the meteoritic value. Rotational velocitieshave been determined in order to investigate the supposed dependence ofactivity and Li depletion on rotation.Based on observations performed at the European Southern Observatory, LaSilla/Chile. Multicolor photoelectric polarimetry is presented for 167 stars, most ofwhich are variable stars. The observations constitute a data set thatfor some stars covers a time span of 35 yr. Complex variations are foundover time and wavelength and in both the amount of polarization and itsposition angle, providing constraints for understanding the polarizingenvironments in and around these cool stars. We present results of a search for nearby star clusters and associationsusing Hipparcos Catalogue data, restricting the sample to stars withparallaxes above 2 mas (d <~ 500 pc). Two new OB associations havebeen identified in the Carina-Vela and Cepheus-Cygnus-Lyra-Vulpecularegions. A very probable new open cluster has been discovered in Carina.The cluster, a Car, named after its brightest member, is young (60 Myr)and nearby (d = 132 pc). However, only seven bona fide members can bedrawn from the Hipparcos data. We report a detection of nine opencluster candidates in the distance range of 150 to 400 pc, and sixpossible associations almost all located within the Gould belt, althoughslightly older than the known nearby associations. In all cases, wepresent Yale theoretical isochrone fits to the color-magnitude diagrams,which indicate a moderate spread of ages between 60 to 200 Myr.Evidently, these young open cluster and association candidates arerelated to the overall distribution of young OB and A-type stars in thesolar neighborhood. We discuss the nature of some galactic open clusters by using propermotions and parallaxes from the Hipparcos and ACT catalogues. We showthat the clusters Collinder 399, Upgren 1, NGC 1252 and Melotte 227 donot exist. Collinder 132 is found to be mainly composed out of membersof an OB association, but there may be a star cluster present in thisarea too. Roeser & Bastian (1994) proposed that NGC 2451 consists oftwo star clusters. We show that NGC 2451 A definitively does exist, NGC2451 B may exist. 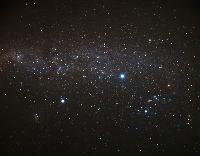 A star cluster may also be present in the area ofRoslund 5. The Hipparcos data finally confirm the reality of Collinder135. A Renewed Search for Water Maser Emission from Mira Variables. Based on new pointed ROSAT data, we revise the X-ray dividing line forlate-type giants in the HR diagram. We compare the new data with wellcalibrated evolutionary tracks and suggest that the resulting picturecan entirely be understood as a consequence of the differentevolutionary history of stellar activity in different mass-ranges. Inparticular, hot coronae disappear slowly in the course of stellarevolution, since the evolutionary tracks are parallel to the revisedX-ray dividing line and do not cross it. Furthermore, hybrid stars turnout to be quite common: they are just more massive, more active andmaintain some coronal plasma beyond the onset of cool winds. Hence, thelatter may be mostly independent of the decrease of stellar activity. The detection of 74 new southern stellar SiO, v=1, J=2->1 masersassociated with IRAS point sources is reported. 57 of these were foundin an IRAS based survey of oxygen rich stellar envelopes. The detectionrate in this survey was 45%. 17 further new maser sources were detectedduring a search for strong pointing sources for the Swedish-ESOSubmillimeter Telescope (SEST). The distribution of the IRAS lowresolution spectral (LRS) classes of all the SiO masers (this paper andliterature) peaks sharply at class 15. The distribution of the LRSclasses of the maser sources from 21 to 29 is similar to thedistribution of these classes of all the point sources in the pointsource catalogue except for class 25. Only few maser sources of thisspectral class are known. This is possibly explained by a selectioneffect. NGC 2451 - What is it? During the last decade, a debate has arisen whether the grouping ofstars called NGC 2451 is a real star cluster. We investigate thecorresponding area of the sky kinematically, using proper motions of thePPM catalogue. The group of stars that was originally called NGC 2451shows a large scatter of their proper motions, which proves that they donot form a cluster. However, close-by we find a group of 24 PPM starswith common proper motion. A colour-magnitude diagram of 19 of theseshows an extremely well-defined main sequence, giving a distance ofabout 220 pc. This cluster is not NGC 2451. We tentatively call itPuppis Moving Group (PMG). There is strong indication for a secondcluster at about 400 pc. Photometry, radial velocities and propermotions of stars fainter than the magnitude limit of PPM are needed tofurther investigate the matter. This paper presents the J, H, K, L, M photometry of 516 sourcespertaining to a sample of 787 sources which has been extracted from theIRAS Point Source Catalog in order to study the late stages of stellarevolution and the concomitant phenomena of mass loss. Three differentclssifications of these sources based on broad-band photometry and IRASlow-resolution spectra are given, and the distributions of the sourcesin terms of these classifications are presented. A subsample of peculiarsources, believed to have recently undergone a helium flash, has beenisolated using the K - L, (12-micron) color diagram. Some objectsmeriting further study are also mentioned. The first results from a survey of circumstellar CO(1-0) emission arepresented. The sources were selected from the IRAS point source catalogaccording to the IRAS color criteria described in van der Veen andHabing (1988). The sources have good quality fluxes at 12, 25, and 60microns, flux densities larger than 20 Jy at 25 microns, and aresituated more than 5 deg away from the Galactic plane. The survey isundertaken to study the relationship between mass loss rates, dustproperties, and the evolution along the AGB. The sample consists of 787sources and contains both oxygen and carbon-rich stars, including Miravariables, OH/IR objects, protoplanetary nebulae, planetary nebulae, and60-micron excess sources. So far, 519 objects, situated on both thenorthern and the southern sky, have been observed; 163 sources werefound to have circumstellar CO emission, and in 58 of these CO emissionhas not previously been detected.